The Microsoft Skype team announced today that it started to roll out an updated version of Skype 8.25.0.5 that will replace Skype Classic (version 7.0). Microsoft reveals in the announcement that any Skype version that is not the latest version that Microsoft released -- version 8.0 at the time of writing -- will stop working after September 1, 2018. 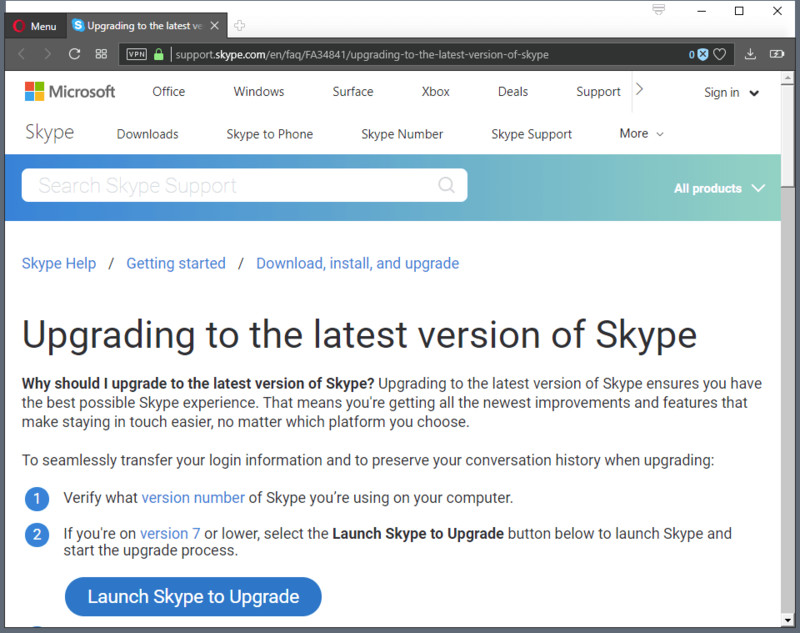 To avoid potential service interruptions, Microsoft notes that users and system administrators should update older versions of Skype to Skype 8.0. Microsoft released the first version of Skype 8 in October 2017 to the public. The release caused a bit of confusion on Windows 10 systems as Microsoft wanted to enforce the use of the Skype UWP (Universal Windows Platform) application on devices running Windows 10 version 1607 and later. In other words: Skype 8.0 was only available for Windows 10 version 1511 and earlier, Windows 8.1, and Windows 7 officially. System administrators and users can download the new version of Skype from the official website but the new version won't install on newer versions of Windows 10. The upgrade FAQ that Microsoft published has a "launch Skype to Upgrade" button that users may activate on the page to start the upgrade process this way. System requirements for Skype have not changed. Skype 8.0 requires a 1 GHz or better processor, 512 MB or more RAM, and a DirectX 9.0 compatible video card. Skype migrates data such as the contacts database, history, credentials, and shortcuts to the new version of Skype. Users need to be aware, however, that only the conversation history of the past year will remain accessible inside Skype. History that is older than a year will be saved to a file on the local system that can be opened outside of Skype only. Users are asked to select Menu > Application Settings > Export Chat History to find the history file on the local device. Free HD video and screensharing calls. Sharing of photos, videos and other files. Private conversations. Signal protocol support. Call recording. Cloud-based, everyone is informed. Some of the upcoming features look interesting. Support for private conversations using the Signal protocol or call recording (with the caveat that it supports cloud saves only) look the most interesting in my opinion but others may find read receipts, invites, and group links useful as well. Now You: Do you use Skype? Previous Post: « Microsoft already working on next-gen operating system? I used to use Skype a lot. After Microsoft bought it, though, they worsened it in a number of ways. As a result, it stopped being useful to me a couple of years back, and I stopped using it. @John: so what do you use now? I hear that a lot of my friends use Ekiga. I have never tried it myself though. Just as John Fenderson i used Skype before Microsoft bought it. This is bad news for me because my webcam drivers are only recognised by Skype Classic – this means that Skype 8.0 and newer versions will not be able to use my camera. I have to either buy a new camera to stay using Skype or find an alternative software to video chat my folks. I think I’ll ditch Skype and try to find an open source alternative to it. Is this with the Windows 10 app or the desktop installer? I helped someone with this recently–the Windows 10 app didn’t recognise the (very old) webcam but the camera worked perfectly with the Skype 8.x desktop installer version. This does require setting Windows 8 compatibility mode on the installer to force it to install on Windows 10 (otherwise it insists you use the app–once installed it works just fine without any compatibility mode). Skype 8 is garbage… escpecially since it is forced to be in 1 window only. I will use Skype 7 untill it is dead. I agree – each new version gives you less control. Such as privacy settings – no way to set it to record only last week of history or none at all. I switched back to Skype 7 and will search for an alternative once it doesn’t work. What about Linux users? How does this effect them? Isn’t Skype for Linux a few version numbers behind? I believe, this version 8 is based on Electron. Basically shipping you a Chromium to be able to use the WebRTC-feature in it for video calling. Entirely ridiculous, especially for an application that you’re gonna keep open all day, but Chromium/Electron does run on Linux, so there’s essentially no effort involved for Microsoft to support Linux. This is only going to encourage more people to move onto Slack, Discord, Telegram, Whatsapp, etc. With the killing of the classic application Skype loses its last bit of relevance as it has very few things left to distinguish it from the more popular chat clients. Skype adding cross-platform video call recording this month, Mac, iOS , Android, Linux included. Twice awful UI after the update. Aren’t there classes in UI design? Why do Millennia’s have such a poor sense of design? Lots of focus on chatting. I don’t chat on Skype, so don’t give a crap. That’s what unlimited texting on cellphones is for. They made a lot of functionality much harder to find. The new app has fewer settings and options. What I miss is the option to have the contact list separate from the chat windows. I can adapt, but the grandparents are gonna hate it. Definitely skype is rubbish, as is their support. At least move to some open source solution so you won’t need to move again which could be the case with a commercial product getting bought in the future. The UI of this newer Skype version for Windows is TERRIBLE. (New UI for Android is even more terrible, but that’s another story…) These newer Skype versions have definitely lost functionality and ease-of-use, too. Everyone I know who’s used them has hated it. I do, too. Having used Skype since 2003, this latest version represents the biggest UI change yet and is extremely difficult to get used to and accept. What a great pity Microsoft ruined a great UI for this garbage! And now come September Microsoft will FORCE everyone to use it! I dislike these strong-arm tactics intensely. It’s also going to be hopeless trying to get older folks I know to be even minimally conversant with this newer Skype version–which is a great pity as there are a lot of people who use Skype to keep in touch with older family members. What a pity so many things get worse! One more app ruined by Microsoft. I unfortunatekly updated to skype 8.25 which may bring new features but is lacking of a lot of previous one. So I deinstalled it and reinstalled Skype Classic. Note that Ekiga does not encrypt communication. I beleve the best replacement for Skype is Jitsi. Well, the best open source alternative is indeed the Jitsi desktop client. Though, these days it is treated as “legacy” and they work mostly just on Jitsi Meet. While the Jitsi client works over Jabber and supports OTR, unfortunately it has its flaws too. Most notably problems with speeds of file transfers and the reliability of them, message loss when connection of one partner isn’t stable, and such unpleasant things. In 2015 I was fully convinced of alternatives like these, but the cruel reality made my bubble burst. So even though I wouldn’t like all these closed services, these days I stick with services such as Discord. The lack of man power behind the open source alternatives sadly can’t be overlooked or ignored, as these ultimately most notably also influence the user experience for people who don’t know much about programs in general. I can speak from experience, so … that is what I meant with cruel reality. Can’t believe the people that ruined Skype are still working at Microsoft. Well, Windows 10 is around so I guess it makes some sense. I’ve used Skype for work purposes for years now. Working with several clients and contractors closely, as many of Skype’s features had allowed. The new changes and design limit my work flow and even how I am able to work. I get that Microsoft thinks they know best and can force changes on their products; that people will simply get used to them. They clearly don’t, however, understand how changing the product to these degrees is ruining user experience. Nor do they understand how people relying on Skype need to use it. Who knows why these changes, in their minds, absolutely HAD to take place. I will likely find other sufficient solutions and share them with colleagues, friends, and family. Everyone else be prepared to say your farewells to what was once a communication program that dominated many others. All that seems left for it, is to devour is itself; fade to black. A nice and thorough as usual “Skype alternatives” article from Martin would be most helpful and appreciated! When it stops working its the day I will stop using it…. M$ totally f***** up Skype with v8, not thank you. It’d be interesting to know when and who started the massive trend of software upgrades, that are in fact complete, lazy downgrades. That “upgrade” message from Microsoft at the top is full of lies. I remember the times when updates were anticipated with excitement, did not occur every week and truly brought new features and actual improvements for the users. Skype 8 is not horribly bad in itself but when compared to Skype 7, it is utterly ridiculous. Skype version 8 is a great program and the “8” is to remember and to honor another great MicroSoft product that was immensely succesful and conquered the world in no time; I am speaking about Wondows 8! Using Skype 8 you get the feel that you are back at Windows 8. So be forewarned with MS products when there is an “8” in it!!! And it has an admirable function built right into it, that has cost a lot of developer’s work: it no longer has the option to stop program updates; another fine function. While Skype Version 7 was using only some 70 MB space it became quickly clear that a quick remedy was needed to improve that. Therefore version 8 now takes some 185 MB. Every line of code exponentially increases the chance of program errors. So the chance for errors in version 8 is some 7 times higher! can someone recommend free or opensource alternative program to skype? i am blind, use nvda screen reader and only love windows xp! i need one free or opensource program which is accessible for screen reader users and has support for windows xp, without forcing to update. i sincerely appreciate any of your help, God bless you all! @chesscanoe: Wow, that’s great news. I was hoping for something like this. Thanks for posting this! The Skype for Desktop Classic version 7 situation seems to be rapidly evolving. A possible way to follow what is going on is to check this FAQ. You’re right–that’s the most up-to-date info yet, current as of today Sept. 3. That article was interesting and informative. I wasn’t aware of all that–thanks for posting it! Good to know MS finally seems to be seeing the error of their ways… :) Thank God they’re keeping Classic Skype 7 around for the time being, and reining in some of their most egregious recent idiocy. The latest Skype versions for desktop and Android were so horrible as to be unbearable. I had to roll back to earlier versions in both cases. Hopefully they won’t release such unusable abominations in the future! whats your solution for windows xp users like me? i am blind and for many reasons, i cant realy use newer versions of windows and also, wish to use skype. i am always afraid of losing skype and was worried about this situation since 2014 (exactly the first time which i installed skype). i wish to use the best version of windows for myself, but realy dont want to lose skype. when i dont need the new features of windows and realy cant update windows, why should i miss my favorite messenger for contacting family and friends?! please provide a solution for xp users. I tried Skype for Desktop 8.28.0.41 using its Private Conversation mode, which worked for text and sending an image. How it works is described at https://medium.com/@justinomora/demystifying-the-signal-protocol-for-end-to-end-encryption-e2ee-ad6a567e6cb4 . It sounds secure to me, a cyber layman, but since the technology, if not the implementation, has been around for a few years I suspect those who really care about breaking it have already done so. “Skype Private Conversation protects end-to-end content between the sender and recipient using the Signal Protocol. This prevents Skype, Microsoft, and third parties from decrypting user content.” Scepticism may be warranted? Skype Classic version 7 was NOT retired on Sept. 1. Go up a few comments and see the Microsoft Answers link chesscanoe posted. SKype 8 is still a useless pile of garbage. I will have to find another chat to use. Re Windows 10 users: While I still have Skype (8) Desktop installed, I now exclusively use Skype for Windows 10. It has been updated to accommodate old style or Private IM just by clicking either icon of choice. Very convenient to swap between an active old school IM and a Private IM with the same contact. “VoIP is good alternative for Skype”: wrong, because Skype *is* VoIP.